This service is quiet, contemplative and intimate. About a dozen people gather at the front of the church where the choir normally sits. It is entirely spoken and follows the order of service found in the little maroon Book of Common Prayer (BCP), copies of which are found in each pew. Some say that the traditional language of the service helps them feel a part of something ancient and transcendent. Others like being up early and having the rest of their Sunday free! 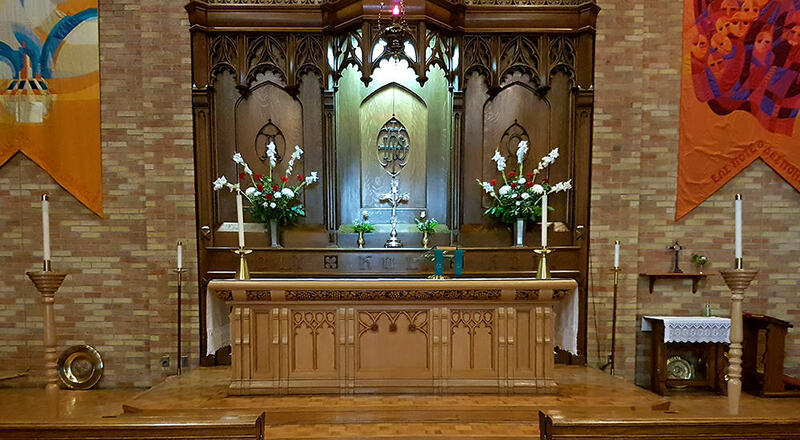 The service includes prayers, readings from the Old and New Testaments of the Bible, and a homily, and culminates in the ritual of Holy Communion – the sharing of the bread and wine that represent the body and blood of Christ. This service has an informal feel to it. It follows a contemporary language order of service written entirely in the bulletin, based on the Book of Alternative Services (BAS). The music is a mix of old and new, some from the hymnal, some printed in the bulletin. Prayer ministry at the back of the church is available during Communion. Our Standing Stones Eucharist occurs once a month on the second Sunday of the month at 9:15am. It is a service which blends both Aboriginal & Anglican spiritual traditions and is rooted in Aboriginal values of inclusiveness around the circle of relationship. Attendees are welcome to smudge as they enter. All are welcome. This service follows the traditional-language service found in the Book of Alternative Services (BAS). It is characterized by heightened ceremony, traditional language, and the prominent roles of the organist and choir. The choir leads the congregation in the singing of hymns, the psalm, and scripted responses throughout the service. In addition, the choir sings choral settings of the Ordinary of the Mass, namely the Kyrie, Sanctus, Benedictus, and Agnus Dei. While the congregation receives Holy Communion (the bread and wine) the choir sings a number of motets. The service concludes with an organ voluntary, played on our Casavant pipe organ by our organist and choirmaster, Jeremy Spurgeon. The choral music is chosen from the rich Anglican tradition (from the sixteenth century to the present), as well as from the Catholic tradition predating the Reformation in England. Much of the music is drawn from the Renaissance, a period considered by many to be the “golden age” of choral music. Known for its beauty and serenity, this music helps to create a service which, at its best, becomes a place of contemplation and divine encounter. The frequent use of Latin (and of Greek in the Kyrie) may seem strange to newcomers at first, but it connects us with centuries of believers who came before, and it allows the spirit of the listener to rise with the music itself, unencumbered for the moment by the constraints of language. The Choral Eucharist at All Saints’ is a joyous, restorative, and much-loved celebration. Please join us and experience it for yourself. Children’s Sunday School is offered during this service, as is prayer ministry. 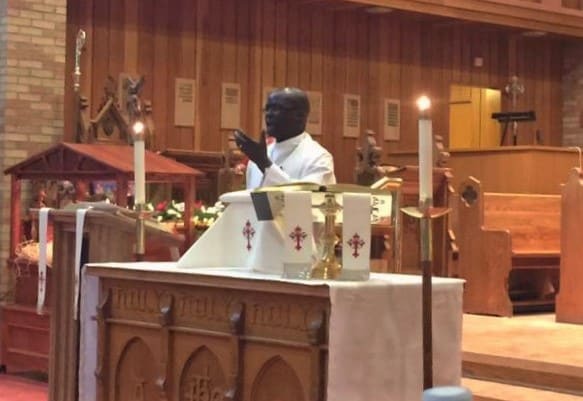 Worship: St. Mark’s-Jieng Anglican Parish worships on Sunday afternoons at 2:00pm at All Saints’ Anglican Cathedral, and is based on the Dinka Book of Common Prayer. Our worship is always conducted in the Dinka Language in Anglican traditions with lovely music and sometimes switches to English service during big occasions. Services are led by Reverend Akon Lual Akon, Rector, and Reverend John Ayuen, Assistant Priest. Learn more about the Dinka Community. Choral Evensong at All Saints is one of Edmonton’s best-kept musical secrets. Normally on the first Sunday of the month, at 7:00pm, priest and choir offer this ancient Service of Evening Prayer set to music. Created by Thomas Cranmer during a time of great uncertainty, danger, and upheaval (the Reformation in the days of Henry VIII), Choral Evensong combines the two older offices of Vespers and Compline. A work of art as well as a service of prayer, it offers a reprieve from the noise and haste of day-to-day life and can be enjoyed by anyone who loves music and poetic language. Congregants may join in the singing of three hymns if they wish, but nothing is required of them. There is no Eucharist (mass), and only a brief meditation rather than a sermon. Those who attend are simply invited to listen and be at peace.